I made a New Year's Resolution on the last day of 2003 to finish this kit as soon as possible. I have been working on it since October 2002, on and off. 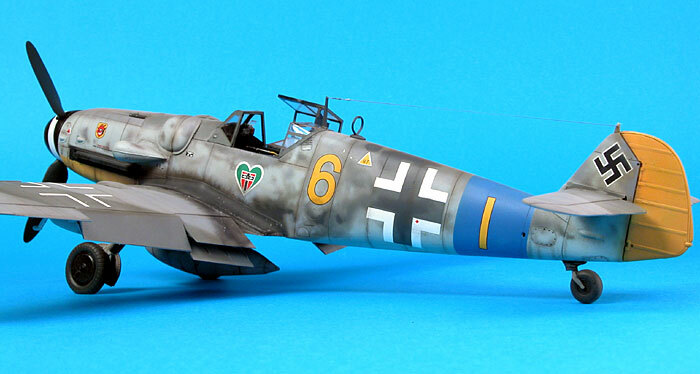 The model is Hasegawa's 1/32 scale Messerschmitt Bf 109G-6 built using Cutting Edge's resin cockpit set and finished in EagleCals decals. This is the model that I used as the subject for the ScaleWorkshop Video series, which may be downloaded elsewhere on Testor's ScaleWorkshop. 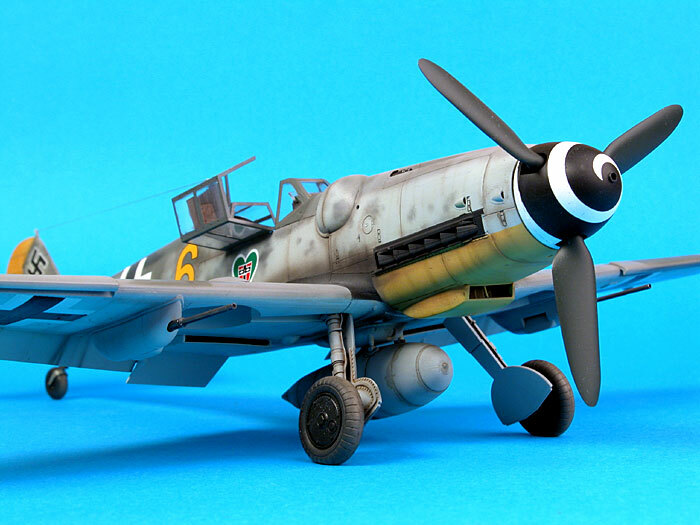 I had nearly finished this model in December, and sat down in early January to apply what I expected to be a few hours worth of finishing touches. 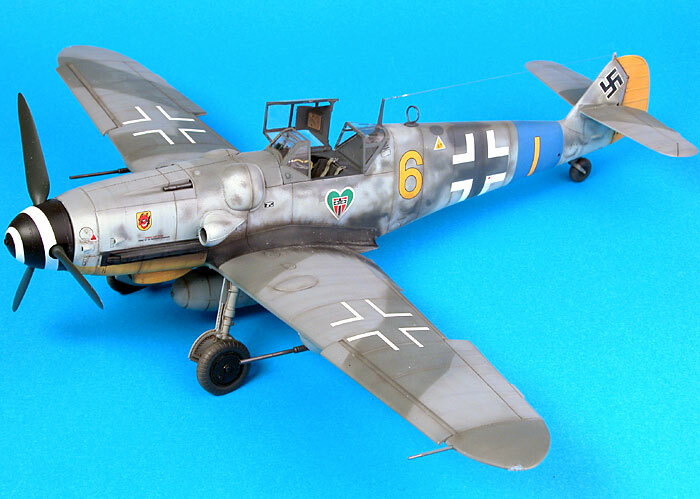 Within minutes, I had smeared glue on the painted fuselage while gluing on the rear canopy section, lost the antenna mast and broke off both bottom radiator flaps. I was not especially happy with the exhaust stain that I had added earlier either. This short session quickly sapped my enthusiasm. Sometimes the best option is to put a model aside and wait for the curse to lift. This was one of those occasions. 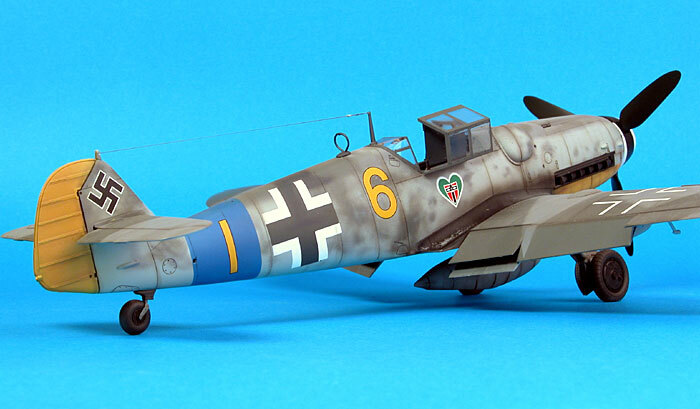 Over the course of several subsequent modelling projects, the 95% complete 109G-6 sat in full view collecting dust. Its very presence seemed to be a mute challenge for me to make another attempt to finish it. Late in March I found the missing antenna mast on my workshop floor. A good omen at last! At the first opportunity (which just happened to be today), I gathered the bits and pieces required to repair and complete my large-scale Gustav. First, the rear canopy section was masked and the smear of glue was removed with light sanding. This area was then resprayed and given a flat coat to blend the repair with the surrounding paint. Next, gun barrels were drilled out. I started by using the point of a scriber to locate the centre. A shallow hole was then drilled in the end of each barrel using a pin vise. The barrels were painted Testor's Gunmetal Metalizer. I decided that the wings looked a little clean compared to the reference photo on the EagleCals instruction sheet so I painted a random mottle of a slightly lighter shade of RLM 75 Grey Violet, then sprayed a heavily thinned black-brown mix in random streaks from the front to the back of the wings and stabilisers. 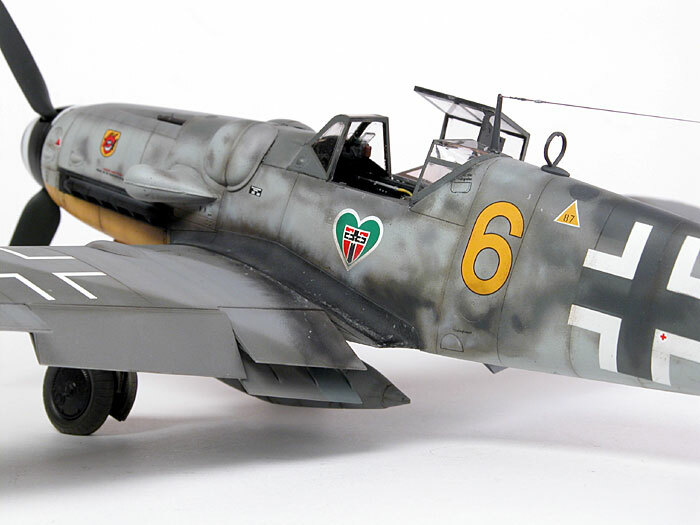 The same mix was used to add some vertical streaks to the engine cowl, and to highlight a few additional panel lines. 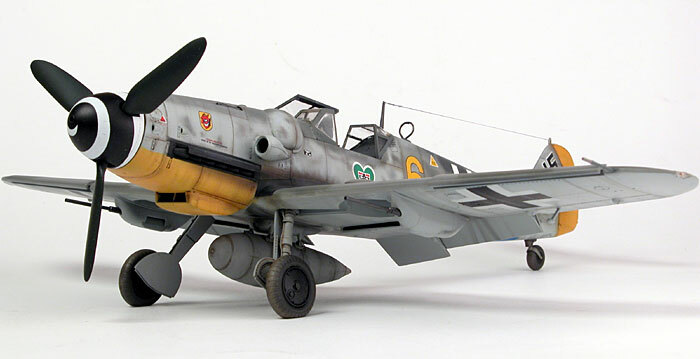 The exhaust stain on the model was difficult to distinguish from the camouflage mottle. I decided to modify the stain to better reflect the reference photo. 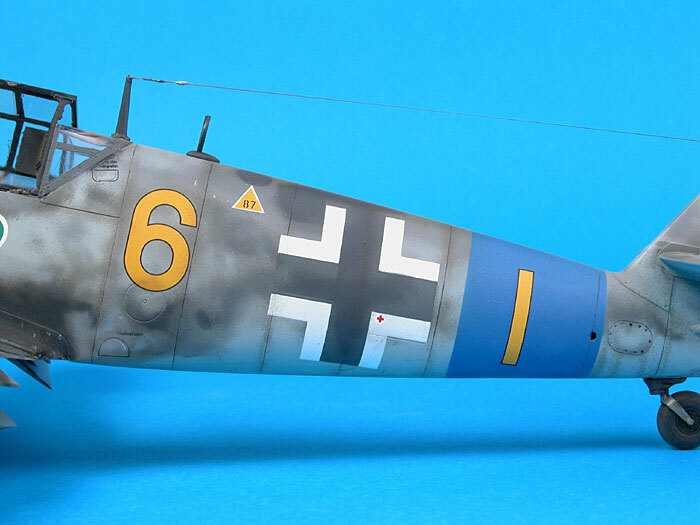 Polly Scale RLM 76 was sprayed on the fuselage side, over the top of the higher sections of the exhaust stain but carefully avoiding the camouflage mottles and decals that were in place. 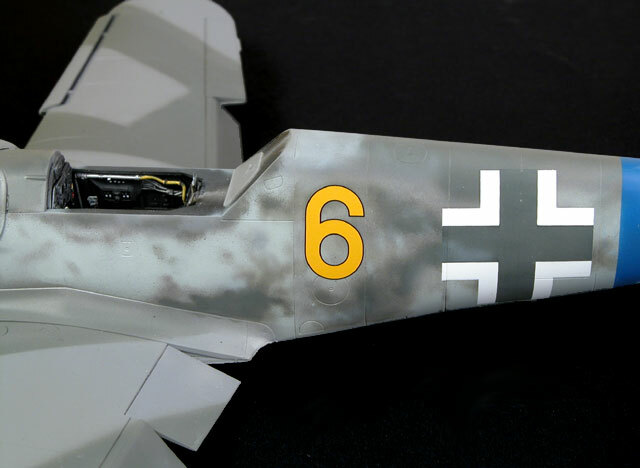 A thin mix of Flat Black was then sprayed onto the wing root, fanning out over the top of the radiator flap, as seen in the reference picture. With the paint repairs and improvements completed, it was time to add the final parts to the model. First, though, I drilled a small hole near the top of the aerial wire post on top of the fin. A length of elasticised E-Z-Line was then superglued to the top of the aerial mast. The mast was glued to the rear of the canopy and left to dry before the other end of the E-Z-Line was threaded through the hole in the fin, and secured with a spot of super glue. When the super glue was set, the excess thread was cut off with a new hobby blade. Installation of the mass balances, navigation lights, gun sight, canopy, bottom radiator flaps and gun barrels completed the job. 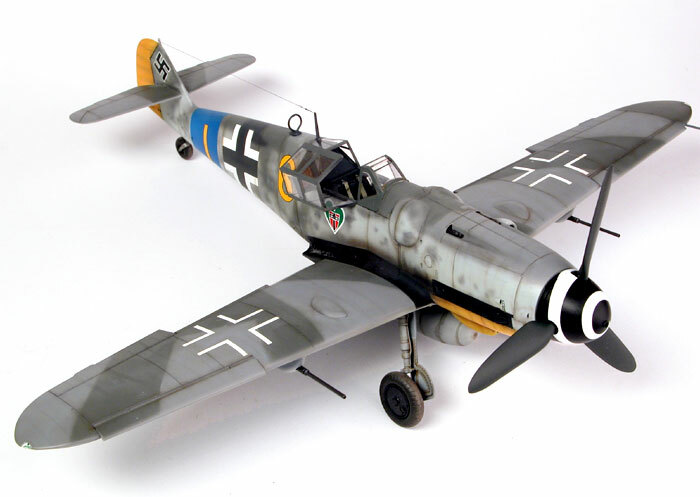 The model was fitted with Cutting Edge's 1/32 scale resin replacement cockpit. This is a simple yet very effective set, and represents a great improvement over the kit cockpit parts. 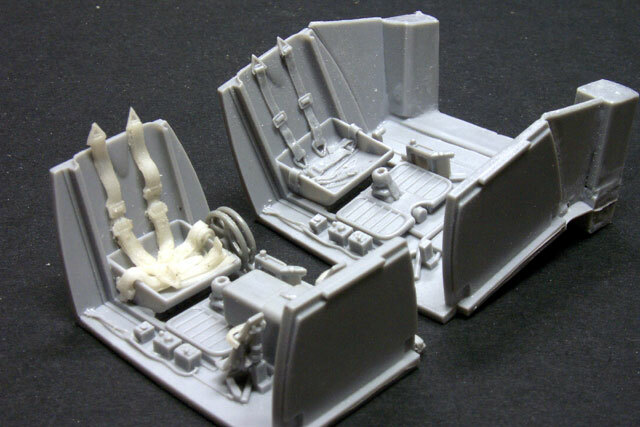 Cutting Edge's cockpit offers the choice of a seat with a cast-on resin harness, or a plain seat with separate flexible resin harness straps. I chose the latter option. 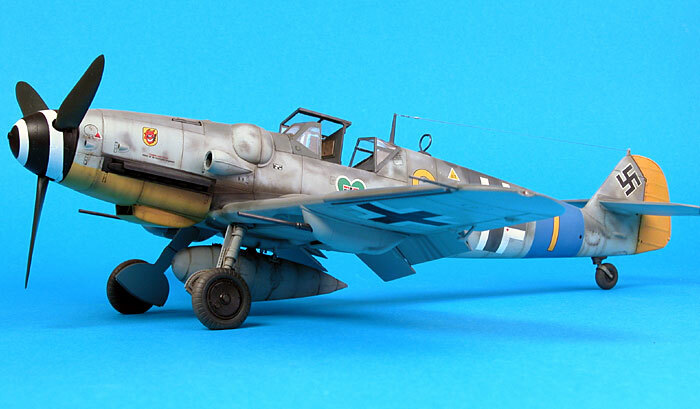 For complete details on the preparation, assembly and installation of Cutting Edge's 1/32 scale cockpit into this kit, see the Review on HyperScale. 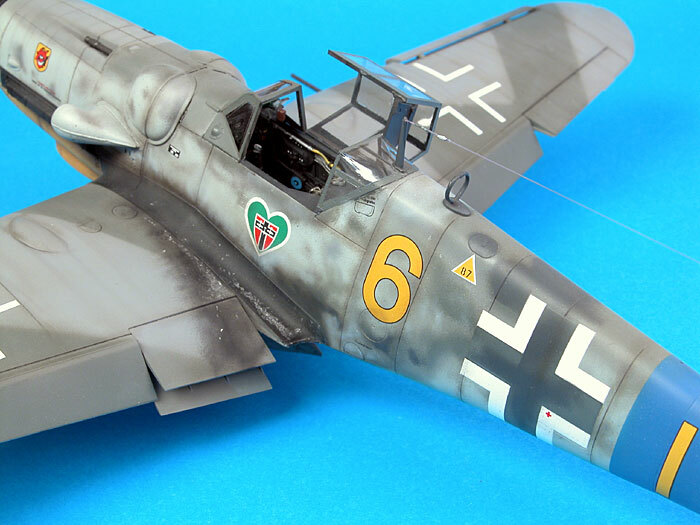 The model was painted using Polly Scale acrylic paints through my Aztek A470 airbrush. 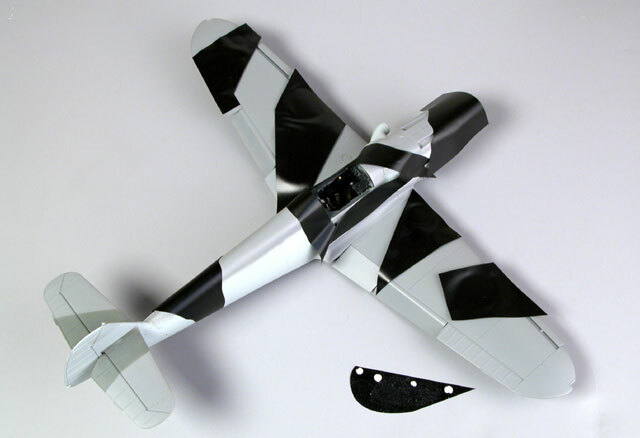 The camouflage pattern was masked with Black Magic self-adhesive vinyl masks. Small blobs of Blu-Tack were used to lift the edges of the masks off the surface of the plastic. 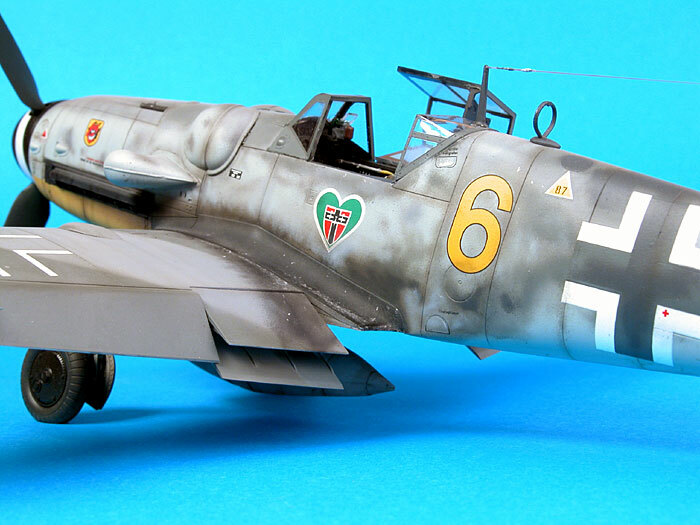 The camouflage mottle was applied according to the reference photo supplied with the Eagle Cals decal sheet. 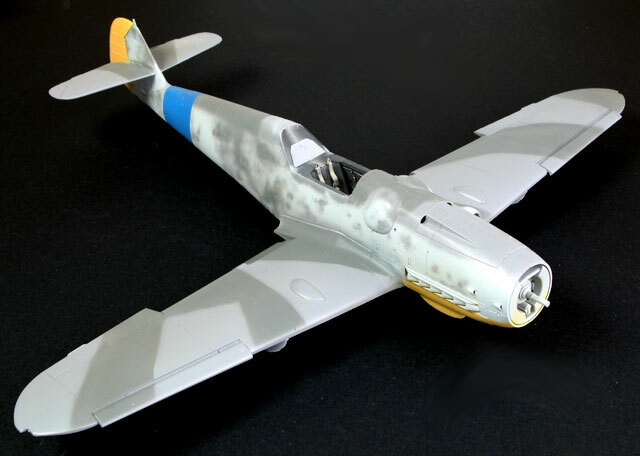 The mottle on the fuselage sides appeared to have endured much repair and respray. The main camouflage colours were RLM 74 Grey Green, RLM 75 Grey Violet and RLM 76 Light BLue, but some unusual colours appear to be present too. I interpreted these as either a very dark version of RLM 74 Grey Green, or possibly RLM 66 Black Grey; plus an unspecified light grey in several patches. EagleCals' decal sheet #41 was used for this project. 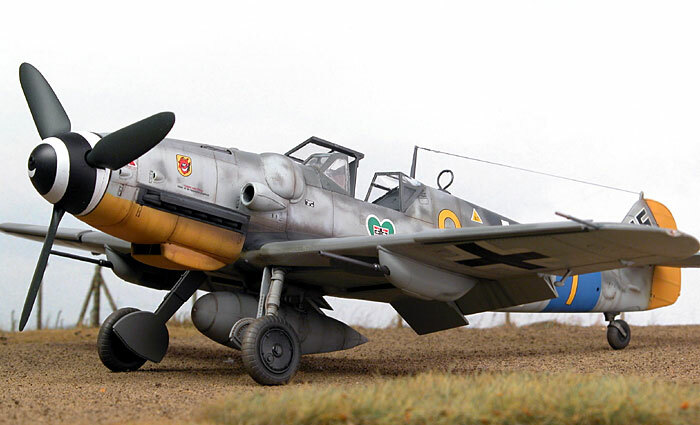 I could not resist the colourful markings of "Yellow 6", attached to 9./JG 54 during February 1944. The decals were thin and in perfect register. They performed beautifully on the model too, conforming to the recessed panel lines very well. The instructions for this sheet are excellent. 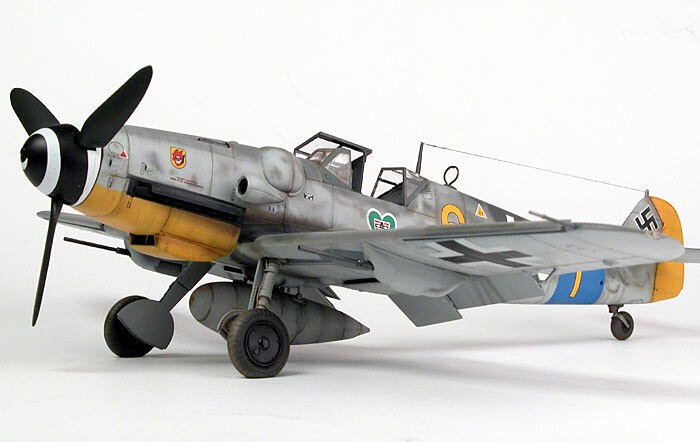 The close-up wartime photo and accompanying notes were invaluable references for the painting as well as the application of the decals. 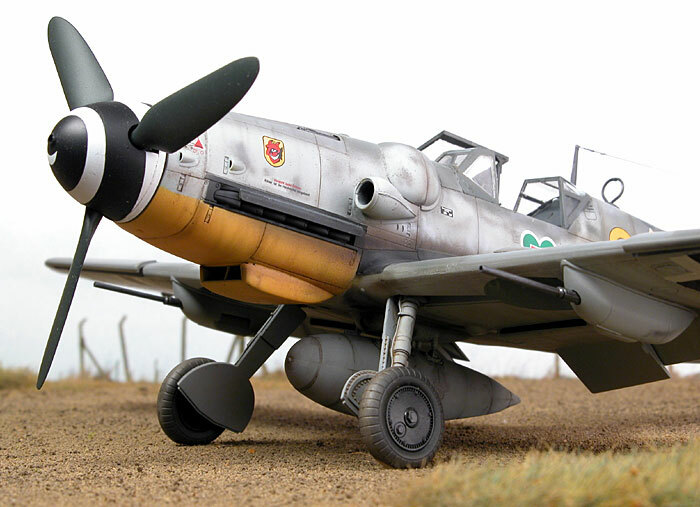 This model was built over a long period of time, but not because the kit was difficult or frustrating. For the first year or so I was pacing construction to permit recording of various stages for the Testor Video Workshop series. The small challenges that popped up early this year were entirely of my own doing and not the fault of the kit. 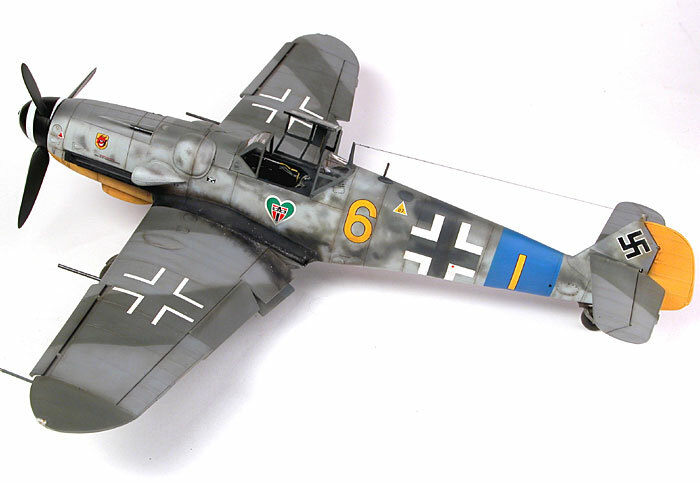 In fact, I rate Hasegawa's 1/32 scale Messerschmitt Bf 109G-6 as one of my all-time favourite models. It is simple to build, adequately detailed straight from the box but a fantastic platform for superdetailing, fits almost perfectly, is accurate in most of the important areas and offers an unparalleled choice of finishes. It is also a good size - not too big, but impressive when finished nonetheless. 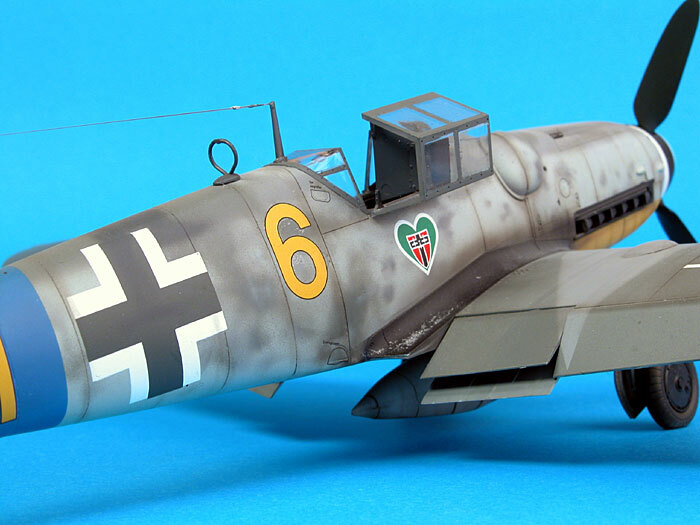 There will definitely be more 1/32 scale Hasegawa Gustavs in my future!